Head-to-head comparison of reliability, validity and responsiveness of four patient-reported outcome measures (PROMS) suitable for assessing health-related quality of life (HRQOL) in palliative care settings: EORTC QLQ-C15-PAL, FACT-G7, FACIT-Pal and short-form FACIT-Pal-14. 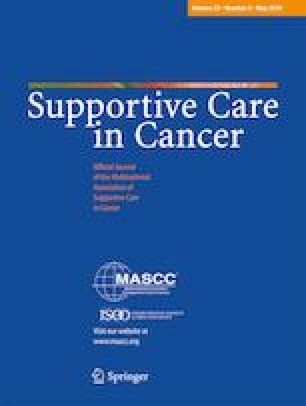 Secondary analysis of two phase III randomised trials: ketamine for chronic cancer pain, octreotide for vomiting in inoperable malignant bowel obstruction. Sub-groups were defined by Australia-modified Karnofsky performance status (AKPS) and participants’ global impression of change (GIC). Two aspects of reliability were assessed: internal consistency (Cronbach alpha, α); test–retest reliability (intra-class correlation coefficient (ICC)) of patients with stable AKPS and those who self-reported ‘no change’ on GIC. Construct validity was assessed via pre-determined hypotheses about sensitivity of PROM scores to AKPS groups and responsiveness of PROM change scores to GIC groups using analysis of variance. FACIT-Pal had better internal consistency (α ranged 0.59–0.80, 15/18 ≥ 0.70) than QLQ-C15-PAL (0.51–0.85, 4/8 ≥ 0.70) and FACT-G7 (0.54–0.64, 0/2 ≥ 0.70). FACIT scales had better test–retest reliability (FACIT-Pal 11/27 ICCs ≥ 0.70, FACT-G7 2/3 ICCs ≥ 0.70) than QLQ-C15-PAL (2/30 ICCs ≥ 0.70, 18/30 ≤ 0.5). Four scales demonstrated sensitivity to AKPS: QLQ-PAL-15 Physical Functioning and Global QOL, FACT-G Functional Wellbeing and FACIT-Pal Trial Outcome Index (TOI). Nine scales demonstrated responsiveness: three in the ketamine trial population (QLQ-C15-PAL Pain, FACIT-Pal-14, FACT-G7), six in the octreotide trial population (QLQ-C15-PAL Fatigue; FACIT-Pal PalCare, TOI, Total; FACT-G Physical Wellbeing and Total). No PROM was clearly superior, confirming that choosing the best PROM requires careful consideration of the research goals, patient population and the domains of HRQOL targeted by the intervention being investigated. The online version of this article ( https://doi.org/10.1007/s00520-019-04754-9) contains supplementary material, which is available to authorized users. The Australian Government had no role in trial design, data analysis, or writing of the report, apart from delegated oversight of the PaCCSC Management Advisory Board. We thank the research teams from Southern Adelaide Palliative Services, Barwon Health, Calvary Hospital Kogarah and Peter MacCallum Cancer Centre for their contributions to the recruitment of study subjects. We also thank Christine Sanderson, Peter Allcroft, Derek Eng, Jenny Phillips and Katherine Clarke for patient recruitment; Tania Shelby-James, Michael Ashby and Amy Abernethy for their contributions to trial design and support; and all research officers and coordinators for their invaluable work. We are indebted to all the patients and carers who participated in this study. Professor King was supported by the Australian Government through Cancer Australia. This study was funded through a grant awarded to the Palliative Care Clinical Studies Collaborative (PaCCSC) from the Australian Government Department of Health under the National Palliative Care Strategy. All procedures performed in studies involving human participants were in accordance with the ethical standards of the institutional and/or national research committee and with the 1964 Helsinki declaration and its later amendments or comparable ethical. The two source trials were publically registered (Australian New Zealand Clinical Trials Registry: ANZCTR 12607000501448, ACTRN12608000211369), approved by ethics committees at all sites and monitored by safety monitoring committees. All participants provided written informed consent.